Imaginosity in Sandyford is Dublin’s Children’s Museum; a special place designed just for kids under nine years, where children and adults alike are invited to explore their world using their imagination, natural curiosity and innate creativity. 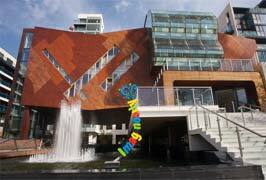 A unique museum, Imaginosity Dublin is specially designed with input from children, parents and educators. It is a veritable wonderland of fun for kids and activity for children.Hosting 2.5 floors of exhibits which are educationally-designed to inspire life-long learning through play, celebrating children’s imaginations on the journey from curiosity to discovery; Imaginosity is a magical place for families.The staff at Imaginosity are all skilled in communication with children and are experts in inspiring enthusiasm in children of all ages. Housed in Europe’s only purpose built eco friendly building for children, Imaginosity Dublin is a wildly colourful world of exploration. The building is built on elevated columns over a pool complete with fountains and lights adding a touch of magic to the Beacon South Quarter in Sandyford. Alongside the exhibit areas, Imaginosity hosts a wide variety of daily workshops incorporating art, crafts, theatre, dance & music for all age groups under 9. 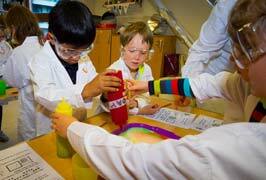 Imaginosity Sandyford run events and special workshops for children throughout the year. From story telling to art projects, from science clubs to stitch and sew groups, there is always something on at Imaginosity. It is advisable to book in advance during holidays and weekends as they operate a ticketing system for their 2 hour visit. Play acting and acting out is an important part of childhood. It is natural for children, particularly the under tens to invent stories and perform them, quite un-self consciously. So the Kids Stage at Imaginosity provides all that they need to make this acting out even more fun. There are a myriad of props to use. There are costumes to dress up in and make up to complete the ‘look’. Lighting and changing scenery give many children their first taste of ‘theatre’. There is the opportunity to experiment with both formally directed theatre and improvisation. So let their imaginations run riot at the Kid’s Stage at Imaginosity… and who knows some day you may be listening to their Oscar acceptance speech. Do your kids harbour dreams of being a rock star? You could start by taking them to visit the Music Corner at Imaginosity. Here children get the change to grab a guitar and watch themselves perform on the big screen. No inhibitions and no worry about the noise. Costumes, different backgrounds and virtual instruments allow kids to be part of a band or solo performers. There are no harsh judges either to comment on their efforts. Let Imaginosity help you find out if you have the X Factor at their Music Corner. Performance and enjoyment is key at the Music Corner. Budding reporters and weather presenters get the opportunity to experience how it feels to broadcast to the nation at Imaginosity’s News and Weather Station. 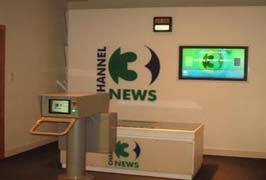 With their special reporter’s jacket and microphones they can put together the latest news stories to be shown on the TV monitors. Or for those who prefer to organise from behind the scenes, operate the camera and ensure you get the best from the presenters. Just like a real TV studio! Children’s natural spirit of adventure and exploration is exercised at Imaginosity’s Climber. This play area spans two floors at the centre of the museum and is a colourful maze of worlds and activities. Crawling, climbing and stretching are all needed in the Climber. The children can explore ‘Out of this World’ and blast off into space. They can go on the Ship and keep watch out through the porthole. The underwater world offers sea creatures to explore and a mermaid to find. On dry land, go into the woods and spot the woodland animals hidden in the undergrowth. Or imagine yourself in your favourite fairy take in the Castle Turret. The Climber provides an ideal venue for climbing, planning and strategising and of course unlimited fun. The Construction Company at Imaginosity is at the cutting edge of environmentally friendly building and design. So kids will learn important lessons about solar power and energy conservation while building and creating. From brick-laying to plumbing, junior builders will have a ball at the Construction Company. But the more artistic are also catered for. Budding interior designers can paint the walls on one of three houses or put up some special magnetic wallpaper. Specially designed for the youngest visitors to Imaginosity, Tir na nOg allows children under 3 their own space in which they can explore their world. There is an apple tree from which to gather apples in your basket or pop into a special chute and make them disappear. There are farm animals to pet and hear what sounds they make. The Little Me area is dedicated to the very youngest visitors, those who are not yet walking. They are invited to crawl over various soft surfaces, watch the changing lights in the light column or sit and watch the fish in the floor level aquarium. Created to nurture and develop motor skills and confidence, this space allows the youngest kids the opportunity of sensory exploration and problem solving. Let your child experience all the elements that make up a typical Irish community. The market offers the chance to be a baker, butcher or check-out operator. And while they play they learn about the journey our food makes from farm to table. The ‘An Post’ Post Office, allows children to understand the world of snail mail including weighing and distribution of parcels. There is even the opportunity to design their own stamp! The Dublin Diner is a must for a quick bite. Or play the part of a celebrity chef preparing the food. At Dr Appleday’s Office, children will learn some interesting biological facts about their own bodies – test how much water is in your body or hear your heart beat on a drum! They will also learn about the importance of exercise and good nutrition. The fun just does not stop – the Town Centre also has a library corner for some quiet down time or a special garage where children can put a car through its NCT or take a spin in the fabulous Audi A1. At Imaginosity, they welcome and encourage visits from primary schools, Montessori schools, playgroups and creches, all year round. They offer different rates and packages for self-guided visits throughout the 2.5 floors of exhibits which are educationally designed to inspire life-long learning through play, igniting imaginations on the journey from curiosity to discovery. As children play, they learn. 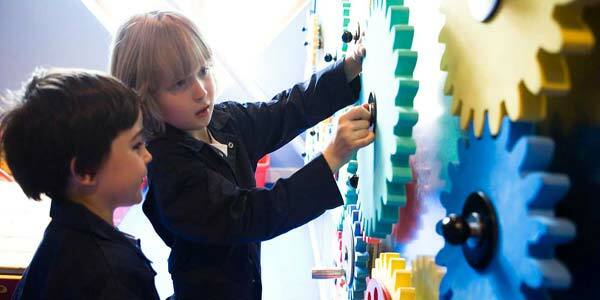 Imaginosity has carefully designed environments that inspire children’s learning. The three principles governing their education and design philosophy are; an appreciation of children’s play behaviuor, a knowledge of how an environment can influence play and learnimg , and an understanding of children’s developmental milestones. Afternoon visit times may be available upon request. Tuesday – Friday: 9.30 am-11.30 am or 11.30 am – 1.30 pm. They also do lunch options for your school trip. 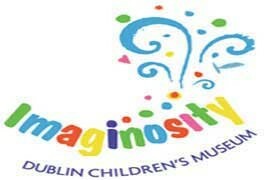 Imaginosity is a private nonprofit and registered charity in Ireland and a member of both the American Children’s Museum Association and the European “Hands On” Association. For health and safety reasons your buggies have to be left in the reception area and they will provide you with baby carriers upon request. Buggies are left in the reception lobby at owners own risk. They provide lockers free of charge for storage of your belongings. A €1 deposit is required. The cafe offers fresh sandwiches, delicious pasta dishes and hot food, a great selection of children’s meals as well as cakes and pastries baked on the premises! During busy periods the café must be used within your two hour time slot. The 114, 75, 46 B and the 11 A all stop on Blackthorn Road, which is just around the corner from Imaginosity.